It has 3 alarm functions siren and signal light, signal light only, siren only, delay timer 0-10s. 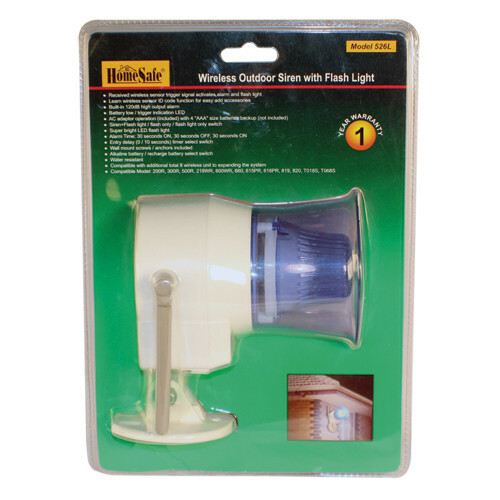 It can be used as a siren alarm with the HA-SYSTEM. The Siren can also be used as a standalone siren by connecting up to 8 additional sensors, HA-MOTION, HA-SENSOR, HA-MOTION-OD. Once one of these sensors detects motion it will sound the alarm. The siren has an automatic shut off. Every 30 seconds the alarm will turn on and off once the alarm is triggered until its reset. The siren comes with power adapter and wall mount. It will work with 4 AAA batteries (not included).